Happy Harriet Carter Wednesday! The weather is getting warmer so it’s time to start wearing some t-shirts, some stylish t-shirts and Harriet Carter certainly has you covered with hysterical (not funny) t-shirts. It’s always a challenge to try to choose funnier products each week so I thought about it and figured, let’s go back to basics. 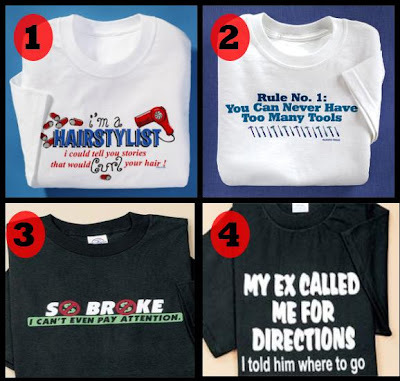 The Harriet Carter empire was built on t-shirts so let’s check some out…. Product # 1 – Are you a hair stylist? Are you also white-trash? Do you want to let the world know just how ridiculous you really are? Well now you can with this t-shirt that says, “I’m a hairstylist. I could tell you stories that would curl your hair!” Really? Why? Are you part of the mafia? What stories are you hearing while you’re cutting hair? Are people admitting to major crimes that they’ve committed? Do you think anyone will trust you once they see your t-shirt? Do people still curl their hair? A more important question, do people really buy this t-shirt? Oh, and are those pills on the t-shirt too? Are you a hairstylist or a pharmacist? Make up your mind. Are you cutting hair or prescribing medicine? You’re confusing me. Product # 2 – Here’s one for the guys. This t-shirt says, “Rule No. 1: You Can Never Have Too Many Tools.” Ok. Thanks. Thanks for that. Do you really need to number the rule? There can’t be more rules for the tools than that one, right? What’s rule #2? Rule 2: Use Tools. Rule 3: Please Like Tools. Rule 4: Tools are Cool, Always. Rule 5: Kill Yourself. No really, if you’re wearing this one, just end it. I mean, what are you really living for anyway? You have a t-shirt on that shouts to the world that you love tools. It doesn’t get any better than that. At the same time, it doesn’t get that much worse than that either. Hopefully, if you take care of that t-shirt you could probably be buried in it. Actually, you should be buried in it. Product # 3 – Are the dirt marks on your face and jogging pants that you’re wearing not really getting the message across that you’re poor? Well you don’t have to make people guess anymore, just have them read this t-shirt. It says, “So Broke I Can’t Even Pay Attention!” Now do you see what they did there? That’s called a “play on words.” You see, this person doesn’t have any money so what they’re trying to say is that they can’t even “pay attention.” What’s funny about that is that there’s no way to “pay attention” or “pay for attention.” That’s the joke. Get it? Hysterical right? I have a feeling that in some 3rd world country there are millions of kids wearing these t-shirts. Well, either wearing these t-shirts or making them. Regardless, these t-shirts are HUGE over in Tajikistan and you know it! Product # 4 – Finally, now there’s an easy way to let your future mate know what a complete douche bag you really are. This t-shirt says, “My Ex Called Me for Directions. I Told Him Where to Go.” Oh you’re tricky! However, why would your “ex” be calling you for directions? Who calls their “ex” for directions? Is there nobody else you would call for directions before you call your “ex?” Do people even call for directions? I think most people use Google Maps or Mapquest. Maybe the t-shirt should say, “My Ex Used Google Maps for Directions. I Told Him Nothing Because He Didn’t Call Me For Those Directions Because He Used Google Maps.” Oh wait, that’s not funny either. Hmm, tough one. As a sidenote, I bet this person is your “ex” because you wear t-shirts like that. Well that concludes another week of Happy Harriet Carter Wednesday. This week, t-shirts. Next week, pillows? You never know.